The rocky planet, at least 3.2 times the size of Earth, is orbiting Barnard’s Star, one of the closest and most well studied red dwarf stars in the Galaxy and the sun’s nearest neighbouring single star. 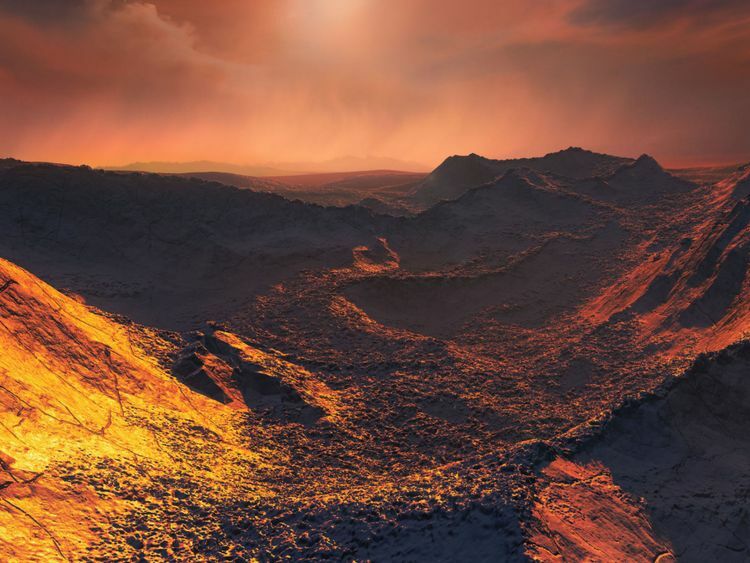 Known as Barnard’s star b, its surface temperatures are estimated at minus 150C. Despite this, scientists believe pockets of liquid water, warmed by geothermal activity, could lie beneath the ice capable of harbouring life. As a red dwarf, Barnard’s star is smaller, older and much cooler than the sun. Although the planet is much closer to it than the Earth is to the sun, it’s surface remains locked in a blanket of ice. Professor Carole Haswell, head of astronomy at the Open University and a member of the international team that announced the discovery in the journal Nature, said: “While the starlight from Barnard’s Star is too feeble for Barnard’s Star b to have liquid water on its surface, Barnard’s Star b probably has a similar temperature to Jupiter’s moon Europa. “Famously, Europa has a sub-surface ocean which has been considered as a potential habitat for life. It is possible Barnard’s Star b may offer similar niches for life. “Tantalisingly, super-Earths like Barnard’s Star b probably sustain geothermal activity for longer than their lower mass counterparts. “This could be helpful to life by providing sustained heat and the chemicals needed to build complex organic molecules. The existence of Barnard’s star b was confirmed after two decades of observations by the Calar Alto Observatory in Spain using the radial velocity technique. This involves looking for light frequency variations that betray the “wobble” an orbiting planet imparts on a star. From these measurements astronomers are able to estimate a planet’s mass and orbital period.